Rice as a cereal grain is the most widely consumed staple food for a large part of the world’s human population. Peru is one of the largest rice producers in Latin America, second only to Brazil. 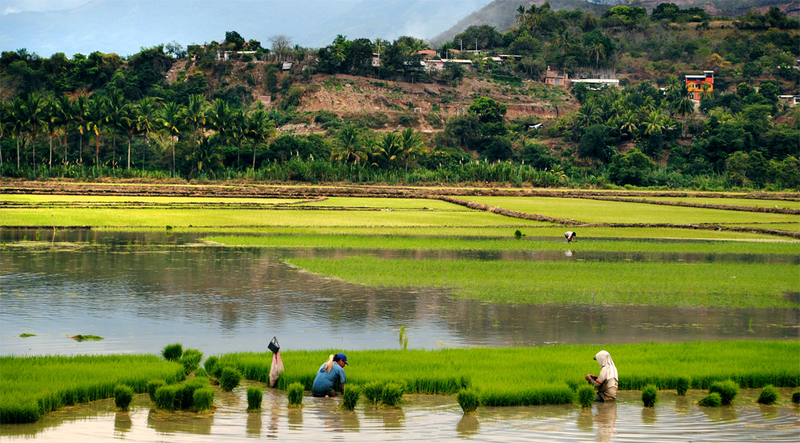 As a result, rice crops are an important component of the agricultural sector. The rice varieties now sown have high yield potential and good grain quality but some of them are highly susceptible to pests and diseases, which lowers yield. CIAT scientists and partner organizations are challenged to develop advanced rice varieties better adapted to Peruvian rice-producing regions that yield more grain and better withstand pests and diseases as well as flooding, drought, and other harmful effects of climate change to continue meeting the country’s demand. Integral to the strengthening of food systems is the continuous improvement and development of climate-adaptive, high-yielding, and disease-resistant varieties of rice. In 2014, three varieties came directly from CIAT and were released by national and private institutions in Peru: INIA 511-La Victoria, INIA 512-Santa Clara, and HP 101-Plazas. The development of HP 101-Plazas started in 2010, when the CIAT Rice Program held a Materials Selection Workshop in which they selected 397 advanced rice lines. HP 101-Plazas has high yield potential, reaching 12 tons per hectare, high resistance to rice blast fungus, and a shorter 4-month vegetative cycle. The variety is also tolerant of low temperature and has excellent culinary qualities. The process to select this variety included evaluation and selection of superior lines for the past two and a half years. It was released by private partner Hacienda El Potrero SAC. This is the first time this company has released a rice variety in Peru. The other two varieties were released by the National Institute of Agrarian Innovation (INIA) of Peru and also contained important agronomic improvements. INIA 511-La Victoria has better agronomic and phytosanitary characteristics than similar commercial varieties and yield potential of 9.5 tons per hectare, as well as high pest resistance and milling and grain quality. INIA 512-Santa Clara contains 3% more iron than traditional varieties, can be grown in a shorter cycle (4 months instead of the usual 5 or 6 months, thus reducing water consumption), its yield potential is between 10 and 15 tons per hectare versus 8 tons of the conventional variety, and it reaches 72% of milling yield compared with the usual 65%. Also, since it is more resistant to fungus and rice hoja blanca virus, the use of pesticides is decreased. This variety is also perfect for growing twice a year in the jungle, an area of Peru with a more sustainable water supply.